If you want to truly express your unique style and personality, Faviana prom dresses feature anything and everything you could want in formal gowns. The mission of the Faviana brand is to make women feel confident and glamorous. Inspired by the latest runway looks, the bold designs of Faviana dresses are fashion forward and red carpet ready. Make a statement on the dance floor with rich and shimmery jewel tones, body hugging fabrics, and just the right amount of embellishments to make you shine across the dance floor. Faviana dresses are designed with the latest celebrity icon styles in mind. 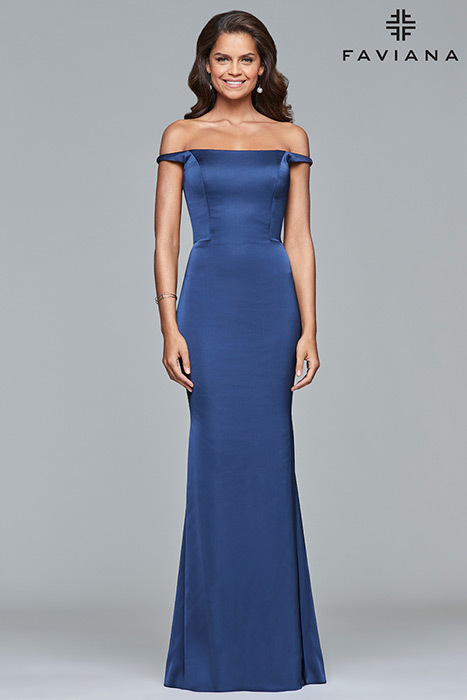 With an enormous selection of styles, you can find the perfect cocktail dress for homecoming or an evening gown for a more formal affair. For an alluring look that's ready to hit the runway, high slits and body contouring fabrics are seen Faviana's newest collections. With so many silhouettes to choose from, Faviana dresses are designed to show off the unique style that fits your personality and body type. One trend that is strong this prom season is the off-the-shoulder style with sheer lace sleeves or bell shaped sleeves. Another gorgeous look is a bodice embellished with sequins, beading, and embroidery, on a flowy chiffon skirt with a high slit. Get ready to rev up the WOW factor on the dance floor in a Faviana couture dress that allows you to express yourself to the fullest. Prom is a special, once-in-a-lifetime event, which is why you should go glam for the evening. PreVue Formal and Bridal has all the latest styles and trends for prom, so make a show stopping entrance on the dance floor with a Faviana couture design that's as unique as you are.